Viborg is one of Denmark’s most internationally minded municipalities. Here globalization is for real and a part of our daily life! International employees, students and researchers from more than 125 countries worldwide live in Viborg Municipality and make up more than 5% of the population and the number is growing. We are very focused on making sure that our new international citizens feel welcome when they arrive and settle down here. 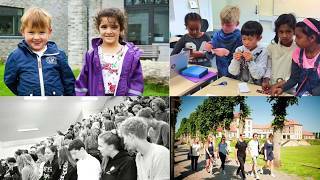 Viborg offers international education at primary and lower secondary level (Cambridge) at VpR International and lower secondary level at Skals Efterskole as well as at high school level (IB) at Viborg Katedralskole. On January 1st 2018 Bulderby International Daycare opened in Viborg Municipality. Bulderby is the first international, English speaking kindergarten group in Denmark outside Copenhagen. Now Viborg Municipality has fulfilled the international care and educational chain in Viborg from 3-18 years. For more information please see the link to the right. For an introduction to the international educational institutions - see the video below or click here. Finding a place to live in Viborg Municipality is the first step to moving here. To make this easier, Viborg Municipality and Business Viborg have created a list of rental options. You can find the list here. Finally, we host international companies, sport clubs and events. In the city center, surrounding Campus Viborg, there is a vibrant international student environment.